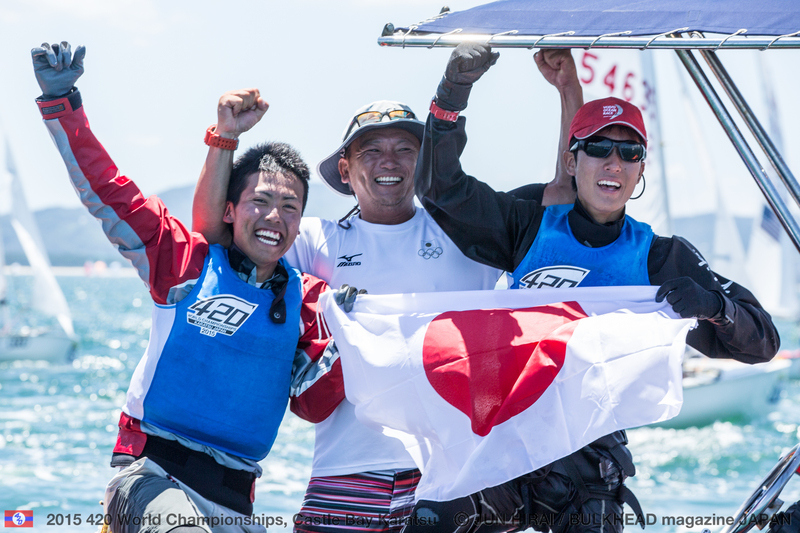 Featuring the cream of Japan's 420 talent, the four-day Championship attracted fifty-eight teams from around the country, with racing on the same waters as will be used for the Tokyo 2020 Olympic Sailing Competition across the bay in Enoshima. Hayama is located approximately 14 miles down the coast from Enoshima. Daichi Takayama /Naoki Ichino won the Japan 420 Nationals by a massive 16 point margin, counting 4 wins from 8 races. The result was more than enough proof Takayama's form has continued strong throughout the year, and after Takayama won gold at the 2015 420 World Championships in July 2015, with then crew Syota Nakano. Second to Keito Onomichi/Riki Tominaga. Third overall and top girls' team were Mano Utagawa/Mina Ohashi. Utagawa finished 7th at the 2015 420 Worlds, with then crew Yuri Saito. Perfectly managing the switch between two classes, in November 2015, Takayama pushed many of Japan's top 470 teams when he raced the Japan 470 National Championships with crew Akira Takayanagi. The pair finished 6th overall, and amongst their highlights was winning race 6 over both of Japan’s men and women Rio 2016 Olympic teams. Find out more.